Heirloom Red Tomato plants are $3.00 each, plus shipping. All plants are shipped Priority Mail. Plants are well established in 2½" square pots that are 3½" deep to provide our customers with larger, healthier plants. NOTE: Number of days from transplanting until harvest is only for comparison purposes between varieties. Actual number of days varies with location and growing conditions. 45-60 days - Determinate. Grown for generations in the Monongahela region of West Virginia. Medium-sized red-to-orange fruits reach 3 inches in diameter--fairly large for such an early type. Nice mild flavor. Excellent choice for early-season use, or for main season in cool-summer areas. Historic old heirloom that earns its keep to this day! 40-70 days - Determinate. Dwarf sprawling plants. 2- to 3-inch, egg-shaped fruits set on very early. Introduced through Seed Savers Exchange in 1984 by Will Bonsall, from the famed Lowdon collection. Has been successfully grown in Manitoba, Canada and even on Baffin Island. Recommended for the North, or for any garden where an extra-early, heavy crop of good, full-flavored tomatoes is desired. 52-85 days - Indeterminate. Potato-leaved vines to 4 feet. Very well-flavored 3- to 6-ounce fruits; a good yielder even in cooler weather. Originally introduced in the West by Milan Sodomka, who obtained the seed from a Czech breeder. Widely grown in this country since 1976, and our own favorite early type for its flavor! 48-64 days - Determinate. The Sub-Arctic series was bred for cold, short-season summer conditions, and Sub-Arctic Maxi is the largest-fruited type of the series. Produces clusters of 2- to 3-inch fruits on very dwarf vines, of outstanding flavor for such an early type, superb for salads/slicing. The plants have a unique growth habit, aborting their main stem in favor of quickly-developing side shoots. Not recommended in gardens where early blight is a concern as the plants have no tolerance to it. Suitable in every other way for Northern, coastal, or high-elevation gardeners, or for anyone else wanting to harvest some of the earliest tomatoes around! 50-55 days - Determinate. Developed by Dr. Harris, Beaverlodge Research Station, Alberta, Canada, this is one of the earliest tomatoes. Grows best in cool conditions and will set fruit in lower tempertures. It has even been grown in the Yukon! Sets 2-ounce fruit. 65-70 days - Indeterminate. 4 ounce potato leaf. Fruits hang in magnificent clusters with this very early and high yielding variety. Exceptional flavor and rich dark red color. 65-68 days - Indeterminate. 7-ounce regular leaf. A high-producing heirloom that was introduced in the 1870's. Flame-red, smooth globe-shaped fruit that are very uniform and beautiful. Heirloom tomato expert Carolyn Male calls this "A workhorse of a tomato," and it truly is! The flavor is rich and tangy, perfect for canning or slicing. 55 days - Indeterminate. 4-ounce regular leaf, for canning or salads. A pre-1930 variety introduced by H. W. Buckbee, Rockford, Illinois. Their 1930 catalog states, "The largest fruited, the smoothest, the finest in quality of all early scarlet tomatoes." Not always quite as early as 50 days, but this is indeed a good producer that has an old-fashioned tomato taste. 55 days - Determinate. Sizable fruits for an early variety, averaging 6 ounces for salads/slicing. Flavor is reported good as well. We're anxious to try this in our cool-summer climate. It comes to us highly recommended. 55 days - Semi-determinate. Compact, potato-leafed plants to 3 feet tall produce lots of 2- to 3-inch, red to slightly orange, round fruits. Primarily for use in salads or wherever a smaller, sweet and juicy dash of early-season tomato flavor is wanted. This variety is a consistent winner in taste trials, at least among early-season varieties. Reliable producer in cooler-season climates; sets fruit all summer long. 65 days - Indeterminate. Salad/slicing/canning. A 6- to 8-ounce regular-leaf variety. A "star" in any garden, this winner was developed by Merlyn and Mary Ann Niedens. This variety sets heavy crops of round fruit with superior flavor for an early type. For quick and steady production, this one is hard to beat. The vines need very little staking. 68 days - Indeterminate. Gorgeous, large potato-leaf vines are the picture of natural abundance covered in golf-ball sized fruits, lovely in salads. The flavor is reputed to be extremely good, often rated better than Stupice, which is our current favorite full-flavored early type. High praise indeed, and we're excited to try it this season in our Maine garden. Developed in the 1980's by John de Rocque of Kimberly, BC, Canada. 68 days - Determinate. 8-to 16-ounce, glossy red round or oblate fruits are of good flavor, possessing a good balance of sweetness and acidity. Produces abundantly even under cool conditions, for which it was bred by Oregon State University master breeder, Dr. James Baggett. The fruits tend to be nearly seedless until late in the season. Resistance to late blight fungus, and compact vines that need no staking, complete this picture of a nearly perfect early-season slicing variety. 63 days - Indeterminate. 4 ounce - regular leaf. Popular old French variety developed by the Vilmorin Seed Company. Scarlet, lightly ribbed fruit have the full, rich flavor that is so enjoyed in Europe. Medium-large fruit are produced even in cool weather. Productive. 60-75 days - Indeterminate vines. An excellent open-pollinated commercial variety from Germany. Vigorous, potato-leaved plants put on numerous clusters of 2- to 4-ounce round fruits, whose superb flavor rivals that of the large beefsteak types. The fact that Matina starts bearing a full month before the beefsteaks makes this variety unusually valuable to the home gardener. Yet the early start doesn't mean the plants quit early--they bear over a very long season! 60 days - Semi-determinate. Superb for canning and fresh use. Excels in cool to cold conditions. The 4- to 6-ounce fruits are globe-shaped to an occasional heart-shaped fruit, and an unusually rich deep red. Early and lavish production of crack-resistant fruits. The flavor is excellent both for canning and fresh use. Like so many of the Russian varieties, it thrives in cooler summer conditions. 68 days - Semi-determinate vines are fairly disease resistant. Deep-red, 3- to 6-ounce fruits are equally useful for canning or slicing. Smooth, slightly oblate fruits are very dense-fleshed and meaty, and show very little core. Flavor is very good, and sweet enough for fresh use. Skins are very thick and tough, which simplifies peeling when processing. The crack-resistant fresh fruits are exceptional keepers as well. Developed in Argentina by Prof. Abelardo Piovano, and a favorite for over 60 years. (AKA Jersey) 60-75 days - Determinate. Intensely red, 8-ounce globes are lavishly produced on sturdy vines. Suitable for fresh use but really excels as a canner! Developed at Rutgers University in 1934 from a cross between Marglobe and JTD (the initials of John Thomas Dorrance who developed soups for the Campbell's Soup Co). This variety once accounted for up to 70 percent of all tomatoes processed in the United States, and helped put New Jersey on the map as a major tomato-producing state. This seed even went into outer space as part of NASA's Seeds in Space program! 62 days - Determinate. 8- to12-ounce regular leaf, for salads and slicing. - One of the best early tomatoes. Dwarf plants produce unbelievable yields of perfectly-shaped fruit that are loaded with old-time flavor and are very sweet. This variety is perfect for the home grower. Developed by Dr. James Baggett, OSU. 60-80 days - Indeterminate. Salads/slicing. Originally a commercial variety from sun-drenched Greece, where it was named for her Second City. Introduced in the US in 1950 by Gleckler Seedsmen of Ohio, whose 1958 catalog said: "Reports of trials with Thessaloniki say 'nothing more could be asked for in tomatoes.' The 4-6 ounce, baseball-sized fruit are uniform, free of cracks and blemishes, and beautifully smooth. Juicy fruits are tangy and full of old-fashioned tomato flavor! Vines are moderately disease-resistant and very productive." We're happy to offer this superior early-to-midseason tomato! 77 days - Indeterminate. 6-to 10-ounce, regular leaf used for paste/juice/slicing. A solid-fleshed, dark red tomato with a good tomato flavor. The vigorous vines often produce good yields up until the time of the first frost. They prefer full sun to a bit of shade. 75 days - Indeterminate. The 2 ½- to 3-inch, oblate, delicately ribbed fruits normally hang in dense clusters of 4 to 6. “Jersey” in tomato nomenclature refers to varieties originating in New Jersey, which was once a famous center of commercial tomato culture, but the term also signifies a certain, unidentifiable “something” in the flavor—a richness, a complexity somehow eluding definition. Atlantic Prize was developed by a tomato grower in Atlantic County, New Jersey during the early 1880s. It is still one of the best of the Jersey-grown stewing and canning tomatoes, and remains highly productive from midseason to frost. Heavy fruiting requires staking. We are indebted to William Woys Weaver for preserving and reintroducing this fine old variety. 80 days - Indeterminate. 8- to 14-ounce - regular leaf for fresh use or sauces and canning. This variety was originally obtained from a Mr. Bisignano, who brought it from Italy and made it available in the early 1980's. Large-sized tomatoes vary in shape. They have thick, flavorful flesh with reaI Italian tomato flavor. 70 days - Determinate. 8- to 10-ounce regular leaf tomato for salads, slicing or canning. 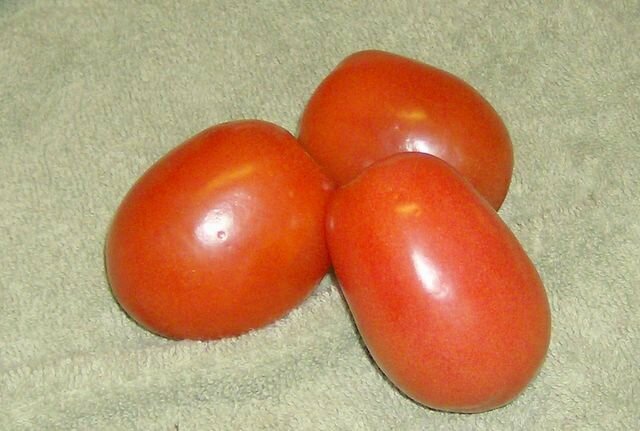 A smooth and attractive medium tomato that has a full, rich flavor. The productive vines yield well even in hot weather. This variety is from Dniepropetrousk, Ukraine, and was named after an early Russian cosmonaut. 78 days - Indeterminate. Deeply ribbed Italian heirloom with a rich, full flavor. Robust plants that do well in hot weather, but will produce even when the weather cools down. Delicious flavor. 80 days - Determinate, 5- to 7-oz., regular leaf From Dade County, Florida, comes a winning tomato for the humid South; developed by the University of Florida to be resistant to the particular problems that affect tomatoes in southern states. Nice sized slicing/salad type fruits are round and smooth; plants are quite productive. 75-80 days - Semi-determinate. 9-ounce, regular leaf. Used for salads,slicing or canning. Good size and uniform deep scarlet color. Great for humid climates. Less cracking than other Marglobes. Tolerant to fusarium wilt, blight and rust. 70-80 days - Indeterminate. An Italian heirloom which produces fruit that are large and deep red with an almost purple tint. The flesh is very rich, flavorful and juicy. A superb tomato; very rare and delicious. 75 days - Indeterminate. 6-ounce, regular leaf, salad/slicing/canning One of the best-known historic tomatoes. Introduced in 1944. Great flavor made this one of the most popular Midwestern tomatoes in the late 1940's. In 1947, Oscar H. Will & Co. stated, "It out-yielded all other varieties in South Dakota trials." Peter Henderson & Co., in 1951, "Two weeks earlier than Marglobe or Rutgers." Plants produce heavy yield of smooth, beautiful fruit even in hot, dry weather. 70-80 days - Indeterminate. 4-to 8-ounce, regular leaf, fresh/slicing Thick-walled, crack-free, fleshy fruits have excellent flavor, a blend of acid, sweet, and earthy flavors. Outperformed all others in a cold, wet year. Yet it's an excellent variety for areas with hot summer temperatures, since it sets fruit well in spite of heat and dry conditions. Produces heavily right up until frost. 85 days - Indeterminate. 5-to 10-ounce, regular leaf, salad/slicing/canning Fruit are fine flavored and yields well. The fruits are surprisingly uniform in shape, vary quite a lot in size, and were very free of blemishes and cracking in our 2006 trial. This variety from Iraq is very rare. 80 days - Indeterminate. Medium-sized, all-purpose fruits. Originally selected by a Seattle market gardener from a variety called "Best-of-All," and carried by the Gill Brothers in the 1960's. Well suited anywhere summers are moist and on the cool side. In 2009 this variety succeeded where many others failed. 85 days - Indeterminate, 6 ounces or larger regular leaf for slicing or canning. Beautiful, smooth, large fruit are globe shaped. Good disease resistance, great yields, perfect shape, and wonderful flavor. This variety was developed by Merlyn and Mary Ann Niedens, long-time seed-growers in Illinois. Bred from heirloom varieties, it has fantastic taste. 80 days - Indeterminate. 10-ounce, regular leaf, multi-purpose tomato. Big flavorful fruit are shaped like a giant, red strawberry, although shape is rather variable. These beautiful tomatoes are loaded with a rich, sweet flavor and have only a small amount of seeds and juice. This superior-tasting tomato is a family heirloom from Germany. 96 days - Indeterminate. Regular leaf slicing tomato can grow up to 2 lbs. A popular old standard variety, deep red and very large; fine flavor, rich old time tomato taste. We think there are many better beefsteak varieties available, but offer it here for those who don't agree. 95 days - Indeterminate.Enormous fruits up to 2 lbs., regular leaf for slicing. "The Crimson Scarlet Brother of Ponderosa," huge size and delicious red flesh. Said to be introduced in 1892 by Peter Henderson, the flesh is very thick and of great quality. This is probably the tomato that made red beefsteak-type tomatoes famous. Believed by some to be the same variety as Beefsteak, but offered here under this name, as so many gardeners have grown it as Crimson Cushion and know it by that name. 83 days - Indeterminate. A regular leaf tomato that produces fruits up to 3 lbs for slicing and canning. This giant of French heirlooms is also big in flavor; it has an intense, sweet taste. The huge vines set on very heavily and yield well in many climates. 80 days - Indeterminate. This 1-pound-plus, regular leaf tomato holds the world's record for largest tomato. If you want to grow a whopper of a tomato, you'll have to remove most of the fruit, so that each plant's resources go into a single fruit. Great all-purpose tomato! 75-85 days - Indeterminate. A rare variety named after Lettie Cantrell, who grew this tomato from seed she received from a soldier returning from Germany after WWII. Lettie said it was the only tomato she grew and that she saved seed from only the largest tomatoes, some of which reach 2 1/2 lbs. A productive beefsteak with a fine flavor. 80-85 days - Indeterminate. 8 ounces or larger. Excellent variety for canning and paste. A large blocky tomato that some consider an oxheart type. Originally from an Amish community in Wisconsin. Comstock Sauce 'n Slice $3.00 Sorry, not available for 2019 85 days - Indeterminate. Recent, all-purpose reintroduction of a popular variety, once in high demand in southern New England. Offered for sale by the Comstock, Ferre and Co. in the 1980's, this tomato is reputedly of Italian origin. All-purpose fruits reach 1 lb, and are juicy enough for fresh use as well as making a splendid tomato sauce. 85 - 90 days - Indeterminate. Lovely, fluted, pear-shaped fruit that is excellent for sauce. Amy Goldman found this in a roadside store in Cernobbio, Italy, named it for her father's grocery in Brooklyn, New York, and featured it in her book. Very meaty and very few seeds. Large one-pound fruit. 75 - 80 days - Determinate. An old favorite, Roma yields large harvests on compact vines, producing thick walled and solid 3-inch fruit that is excellent for sauces and canning. 80 days - Indeterminate. Our favorite paste tomato, and the one we grow for sauce or paste! Blocky, 3.5-inch fruits are produced unstintingly in our garden. Plant this one to mature in hot weather; in our experience, it loses its distinctive rich flavor if ripened in very cool autumn weather. The flavor is, to us, unequalled by any other paste variety we've grown. 80-90 days - (AKA Camp Joy) Indeterminate vines easily grow to 6 feet tall! At 1 to 2 ounces, these fruits are a bit large to be called a cherry, but are superb in salads with their full, rich tomato flavor. Selected by the peppery organic pioneer, Dr. Alan Chadwick, who taught organic gardening at UC Santa Cruz at the time Randel attended that university. Recommended. 55-68 days - Indeterminate. An early, regular leaf, red grape tomato from Reinhard Kraft of Germany. Fruits are about the size and shape of a large Italian-style green olive, borne in long clusters of 15 to 20 fruits. Very rare. 70-80 days – Indeterminate. Regular leaf, Fruits are about an inch across, weigh one-half ounce. Very sweet, tiny cherry tomatoes. Large vines; a wild tomato from Mexico. Very productive! 65 days - Determinate. Tiny ornamental plants reach only about a foot in height, requiring no support. Their stature makes them a superb choice for containers, pots or hanging baskets, or even indoors under lights; covered in pretty little cherry tomatoes, Minibel is ornamental enough for decks or patios. Fruits are bite-sized, sweet and surprisingly well-flavored for a miniature type. 70-80 days - Indeterminate. Developed by Dr. Alan Kapuler, as a dehybridized (open-pollinated) version of Sweet 100. Complex-flavored, one-ounce fruits in clusters or trusses, generously produced over a long season. Not only are they very high in vitamin C for a cherry-type, but also uniquely high in gamma-amino butyric acid, reputed to calm jittery nerves. The plants throw an occasional yellow fruit. 70-80 days - Determinate. Very compact vines yield numerous clusters of 1-2 ounce, plum-shaped beaked fruit, of intense, rich flavor. Meaty fruits are low in moisture and carry few seeds. Not a fresh-eating type, but famous for drying; in Italy branches or whole plants are to be seen draped over fences, drying in the Mediterranean sunshine. Equally good for sauces or paste. While of determinate habit, plants require staking because of the exceedingly heavy crops they are known to produce. 70 days - Indeterminate. 1 ounce, regular leaf, cherry. Small red fruit are pear-shaped. Beleived by some to be the original variety dating back to the 1700's and identified on the basis of old pictures. The original Red Pear was offered by many seedsmen and was very popular for making "Tomato Figs". Whatever the true origins of this variety, the fruit is sweet and flavorful. 80 days -Indeterminate. This old German heirloom was offered in Philadelphia by the mid-1800's. The sweet grape-shaped fruit grow to one ounce in large clusters on the plant. The name means "Giant Bunch of Grapes" in German. It is probably the most popular small tomato with seed collectors, as many enjoy the rich, full tomato flavor that is missing in today's cherry types. Large plants produce massive yields. 60 days - Determinate. Delicious, refreshingly sweet grape type tomatos are elongated cherries, perfect for salads or mixed with other small-fruited types in relish trays. Plants are productive and very compact, requiring little support, making this an especially choice type for containers. Incredibly productive.